October 1- In 1800, Spain cedes Louisiana to France. In 1908, Ford Model T's go on sale at $825. In 1910, the Los Angeles Times building is destroyed by a bomb set by Ironworkers union members upset at the position of the paper on unionization. It was one of many similar bombings during that period (more than 100), but perhaps the most dramatic, with 21 dead and scores more injured. 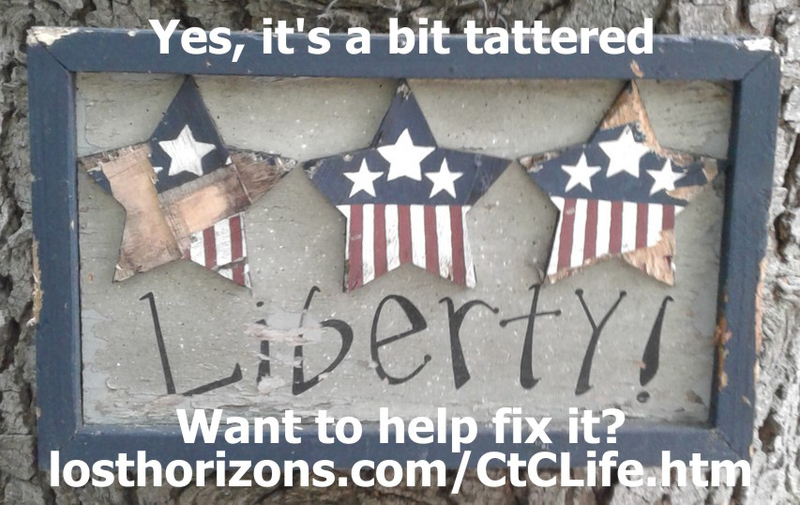 No anti-terrorism measures gutting the Constitution were enacted, and yet life went on. In 1928, the Soviet Union introduces its first "Five Year Plan" for the bureaucratic control of the national economy. In 1946, the "Nuremburg Trials" of Nazi leaders for engaging in wars of aggression come to a close with death sentences for most of the defendants. In 2017, Catalonia votes overwhelmingly (more than 92% in favor) to secede from Spain. The Spanish government had already declared the vote illegal and attempted to interfere with the voting process, but without much success, as shown by the outcome. Less than a month later the Spanish government declared the Catalan parliament dissolved after it formally voted to declare independence. ...and the latest proof that politics will never be the solution to Leviathan. These revelations would, it is claimed, show that the Mueller investigation is a pretense concocted by actors in the deep state in order to effect the undoing of an election result they simply don't like. But it was just theater. Since it was spun the number of released documents has been... 0. The number of persons fired for failing to obey this directive... 0. In fact, since that base-reassuring announcement that there would finally be some real punching back against the hyenas and some deep-state swamp-creatures are about to go down, Trump has much more quietly rescinded the order. Now, the "intelligence community" is given permission to meander through a "declassification review process". So the folks whose maleficent deeds are supposedly meant to be exposed by the declassifications decide what, if anything, will actually be declassified and shared with the sovereign (that is, us). I'm sure everyone remembers the "declassification review" for the JFK assassination docs, yes? Trump had promised to see those all made public in October, 2017. But the deep state balked at the release, and its interests were served at the expense of the public's interest in knowing the truth. Instead of the release we got 6 months of "review" (after the exhaustion of a prior 54 years in which to do such a review) only to end up with another renege of Trump's promise. In April, 2018 documents were released, but more than 15,000 pages of them contain redactions, with still more held back entirely. In other words, Lucy's latest promise to let Charlie Brown kick the football is the same as all the previous ones, despite Donald Trump having unilateral authority to make it otherwise. SIMILARLY CONTRADICTORY OF PROMISES MADE are Trump's foreign policy decisions over his first two years in office. To pick a few examples: The US remains in NATO; the US remains in every war that had been going on when Trump took office; and the US has intimately involved itself in even more wars of choice and aggression. Rather than bring a previously-absent even-handedness to rectifying the dispossession of the Palestinian people, as promised, Trump has dramatically escalated US participation in the Israeli ethnic cleansing of Palestinians from their own homeland. These moves have correspondingly and predictably escalated tensions throughout the Middle East. Similarly broken is a promise for improved relations with Russia. Quite the contrary, Trump has increased military aid to the neo-Nazis put into power in Ukraine by the Obama administration by way of the US-engineered coup in February of 2014; invited direct military engagement with Russian forces legally in Syria under the pretense of actions on behalf of illegally US-armed and -supported radical Islamist terrorists that have been assaulting the secular government of Bashar al-Assad for years; and played along with every spurious, evidence-free-and-often-manifestly-ridiculous accusation against Russia, from shooting down Malaysia Airlines flight 17 to hacking the DNC's mail server. Trade policy continues to be a daft and dangerous program of long-discredited mercantilist nonsense, simply on steroids and with a slightly different shade of lipstick. Nikki Haley, Mike Pompeo and John Bolton are agenda-clones of Samantha Power, Hillary Clinton and Susan Rice-- just more virulent and unhinged. Second verse, same as the first... Same old, same old. Same old, same old, despite the fact that Donald Trump has unilateral authority to have all of these things be otherwise. DOMESTICALLY, the tune is also unchanged. Warrantless surveillance goes on undiminished. Hillary Clinton walks free and Julian Assange continues to languish in prison. Edward Snowden remains in exile. Favored interests get subsidies at everyone else's expense, just as always. The Department of Education has not been shuttered or abolished. Abortion remains legal. 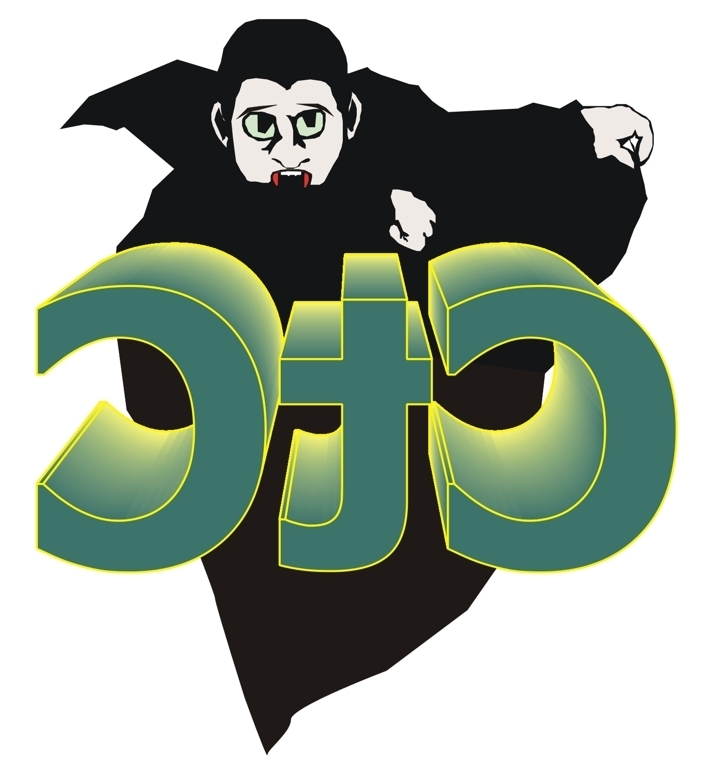 Government distortion of the health-care industry remains undiminished. The Hamiltonian Federalist Society picks Trump's judicial nominations, and, as is sharply highlighted by the current Kavanaugh kerfuffle, offers those who favor an aggrandized state (and especially an aggrandized executive branch) and who come from a deep, if not life-long, immersion in the swamp (though I continue to tell myself that Neil Gorsuch slipped past those filters). The TSA remains in business; there has been no re-opening of the 9/11 investigation; supposed tax reform simply did away with the personal exemption while all nominal rate reductions for most Americans have been or are being offset by tariff increases. 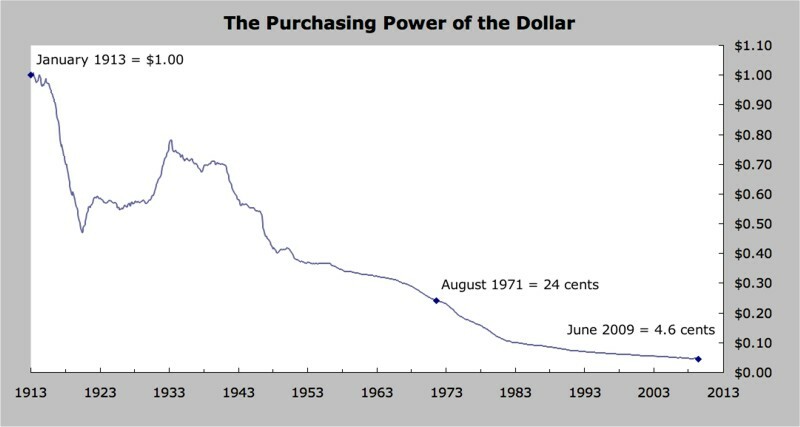 Federal reserve notes continue to be used and continue to lose value. Military spending has gotten a big uptick, rather than a big cut. 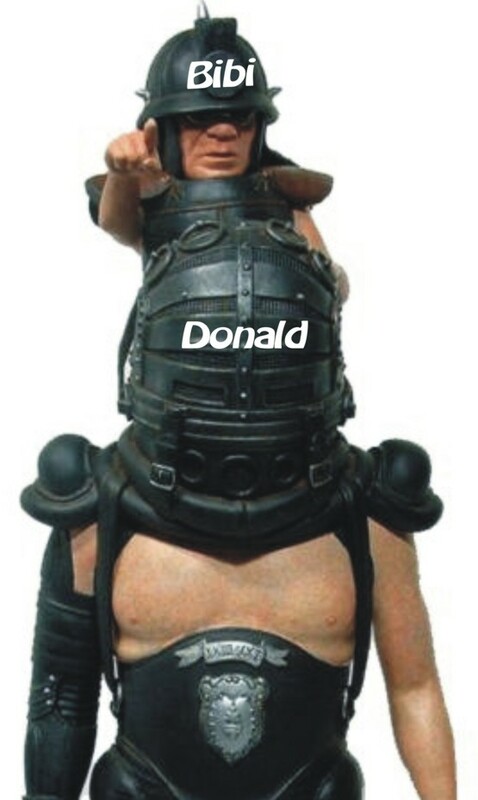 Trump is even adding a "Space Force". Same old, same old, despite the fact that Donald Trump has much unilateral authority to stop, alter or radically reduce all of these things, and has a Congress in the hands of his own party from which he could at least seek the stopping, altering or radical reduction of any of these things. SO, NOTHING HAS CHANGED THAT REALLY MATTERS, despite all the sturm und drang made to swirl about the Trump presidency. There's only one thing to conclude-- the "sturm und drang" is theater. The "sturm und drang" is generated to provide nourishment for the encouraged belief that, as much as he really wants to, Trump dasn't stop, alter or radically reduce all the bad things he promised to stop, alter or radically reduce in order to appear differentiated from Hillary Clinton and get elected, 'cause his presidency is just hanging by a thread, and he must walk a careful line. But this is arrant nonsense. Were Trump to keep his promises and stop, alter or radically reduce all the obnoxiousness described above, he would become politically unassailable. He would be Teflon coated to a degree of which Ronald Reagan could only have dreamt. Replace all of Trump's actions in office-- by which he has simply bled away support by those who elected him-- with the keeping of these promises and his supporting base would be the Rock of Gibraltar-- huge and solid. And yet, Trump has instead done what he has done. Trump is thus demonstrably NOT the great break in the chain he is pretended to be. He is just packaged that way, in a particularly clever move by the deep state. The deep state-- the creators and beneficiaries of the status quo-- took note of the fact that the peasants are restive and have dangerously better access to information than they ever did before. This called for ginning-up a pretense of the astonishing elevation to the presidency of a supposed outsider/non-swamp-creature/adversary-of-"the system". Astonishingly, this pretense took hold, despite the obvious fact that no one who has become a billionaire under the existing regime is ever going to actually be an enemy of that regime. Donald Trump was never going to "drain the swamp". Donald Trump became rich as Croesus under the regime administered by the swamp creatures, and they are obviously his much appreciated friends and benefactors, or his faithful and productive tools. And, as demonstrated, Donald Trump has changed nothing. Swapping out one statist faction's favored beneficiaries of graft and corruption (those of the Democrats) for your own statist faction's preferred beneficiaries (those of the Republicans) is not "draining the swamp". It's just a temporary shift in who's on the A-list for the best spots at the slop-trough. 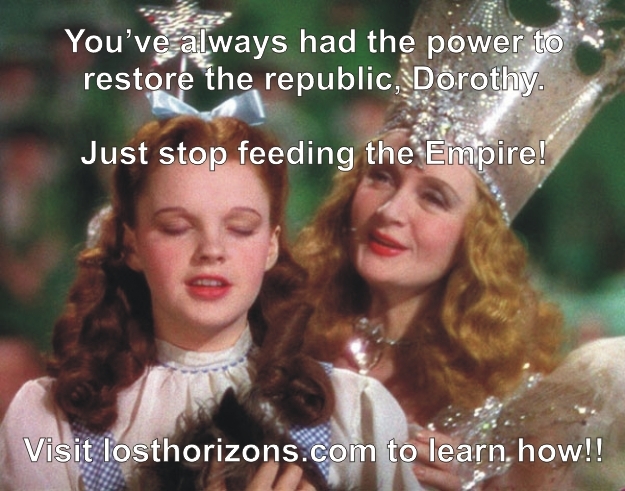 HERE'S THE POINT: The People will never find their remedy and the restoration of the republic-- or even just the liberty, rule of law, and consequent prosperity and security to which they are entitled-- through the political process. 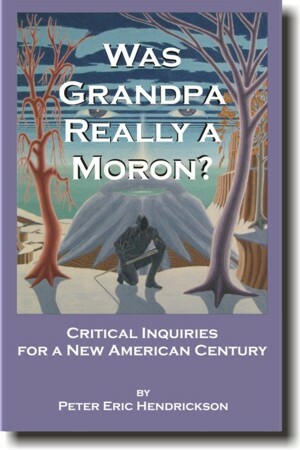 More, the longer the People harbor comforting and apathy-enabling fantasies about the political process, and delay implementing the real remedy-- which is withdrawing their tacit consent and practical support by the means uniquely provided through the information in CtC, as detailed here-- the more arduous and dangerous will be the climb back from the depths to which continued delusionary delay is carrying America. Look closely at the new boss. Recognize that he's (it's) the same as the old boss. October 2- In 1835, freedom-loving Texans begin their war for independence from Mexico. In 1950, "Peanuts" is first published. In 1959, 'The Twilight Zone' airs its first episode. In 1998, historians take note that it is the 160th 2nd of October since Iran initiated military aggression against anyone. In 2002, the "Beltway Sniper" attacks begin. BY PLEASANT COINCIDENCE, ON THE DAY BEFORE Doreen and I boarded a flight to San Antonio for the most recent CtC Seminar I was sent two very interesting documents which I was thus able to share with the gathered members of the community. Each of these docs are remarkable, positive and worthy of a toast. DANIEL AND JANE'S VICTORY, complete and quick and simple as it was, is not the only kind of filing-related tax agency testament to the truth about the tax. Though it may seem counter-intuitive, just as compelling a government acknowledgement is to be found in the almost comical IRS effort to thwart Joe H.'s 2017 claim. That effort is a wonderful demonstration of the government's increasingly desperate struggle to deal with the long-hidden truth about the income tax having been fully and effectively revealed in CtC. Decades into an increasingly voracious exploitation of prior widespread ignorance about the tax-- an ignorance corruptly cultivated by what may be the most robust and longest-running domestic propaganda and co-option effort in American history-- the deeply-addicted state is now a feeding vampire unexpectedly interrupted by shutters flung open and sunlight pouring in. Joe's 2017 victory-in-progress is a great example of the beast's agitated search for obscuring shadows into which it can retreat and survive, and thus a great demonstration of the unassailable legal validity behind Joe's claim. LET'S START OUT WITH Joe's filing-- as simple an affair as it is possible to get: a 1040 EZ and a single Form 4852 rebutting an errant W-2. That W-2 was created by the company which paid Joe for his labor during 2017 and which withheld a total of $13,511.00, as reported by Joe on his sworn docs. That withholding consisted of $7,728.00 withheld as nominal "federal income tax" (under the provisions of chapter 24 of the IRC) and $5,783.00 withheld as Social security and Medicare taxes (FICA taxes) under the provisions of chapter 21. Notice, the agency is proposing a tax liability (we'll get to that in a moment). Against that proposed (we'll get to that in a moment) liability it is acknowledging a credit of everything withheld as nominal "federal income tax"-- that is, the total withheld under the provisions of chapter 24 of the IRC. What is notable about these assertions to begin with is that all of the explanations attempt to characterize the IRS proposed changes (we'll get to that) as being math errors, or transcription errors, or are pure, unadulterated bs. 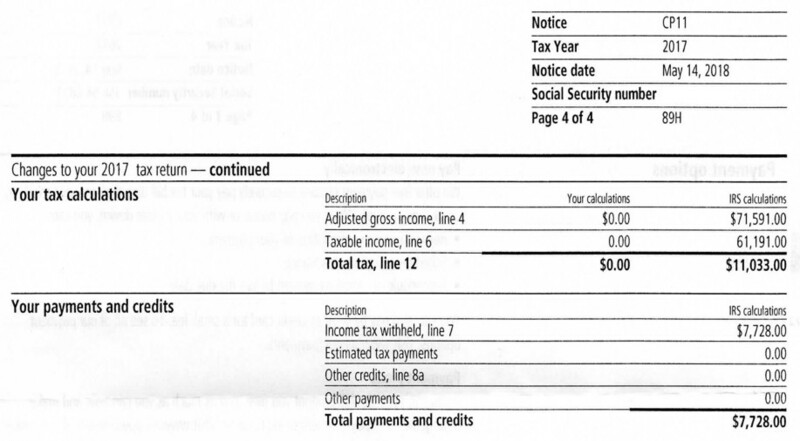 For instance, the first item alleges that the 1040EZ line 4 AGI was changed "to include all the forms W-2, W-2G, etc. 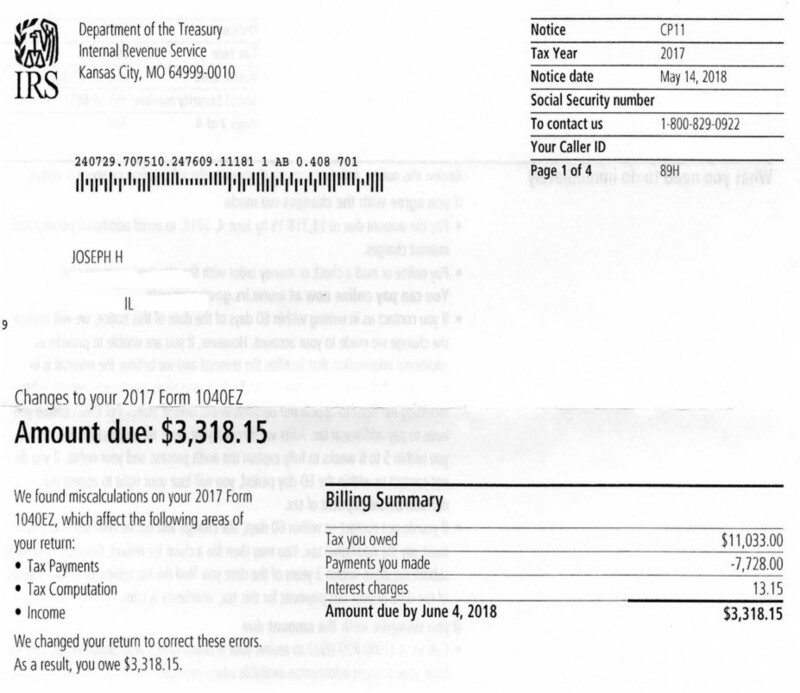 that were attached to your form 1040EZ because there was an error in the total income reported", implying that Joe had not transcribed the "income" amounts reported on his attached forms accurately. But the only form attached to Joe's 1040EZ was his Form 4852. That form reports $0 "wages", a figure accurately transcribed to Joe's 1040 line 1, and resulting in a line 4 AGI total of $0. Pure bs. The next entry is just as much complete, unmistakable horse-hockey. "We changed the amount of taxable income on line 6 of your Form 1040EZ because the combined standard deduction/exemption amount on line 5 was subtracted incorrectly from the adjusted gross income on line 4." Really?! While it's true that Joe mistakenly checked a "dependent" box in the line 5 instruction, IT DOESN'T MAKE ANY DIFFERENCE! No matter what the proper line 5 amount might have been, line 6 still ends up as $0. The IRS did not change "the amount of taxable income" on Joe's 1040EZ because of his incorrectly subtracting the combined standard deduction/exemption. Pure bs. The third item is the same: pure bs. The amount withheld was not changed to reflect the amounts shown on supporting documents-- the sole supporting document was Joe's Form 4852, and the amount of withholding shown on his return is an exact transcription therefrom. The fourth item is yet another bit of nonsense-- Joe never provided information in response to a correspondence or otherwise which contradicted or called into question amount owed or the refund amount claimed on his return. Joe is gratuitously threatened with the possibility of an "audit" if he dares to disagree and the agency doesn't like the "additional information" justifying the abandonment of this proposal, of course. Obviously the agency wants him to just stand down and shut up. But a threat of a possibility is nothing more than that, in the first place; and in the second, the only "additional information" that should be needed to justify the abandonment of this absurd proposal is a brief letter pointing out the bs behind every "explanatory" rationale for the proposed changes. "We adjusted your account to show the tax and/or credit you originally reported..." Now, that's what I'm talkin' about! 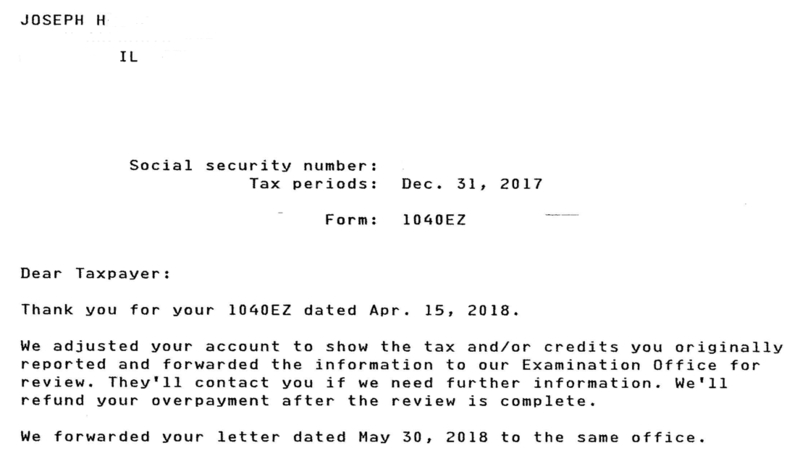 There's one interesting quirk in this response-- the agency refers to what it calls Joe's "1040EZ dated Apr. 15, 2018". Joe's return was actually dated February 20, 2018. But initially, the agency had pretended Joe never filed at all. The return transcript Joe downloaded on March 22, 2018 reported "No record of return filed." However, the agency's May 15 "return transcript" concerning Joe's filing for 2017 shows shows April 15 as the date the return was received (maybe it got lost on someone's desk for a while? 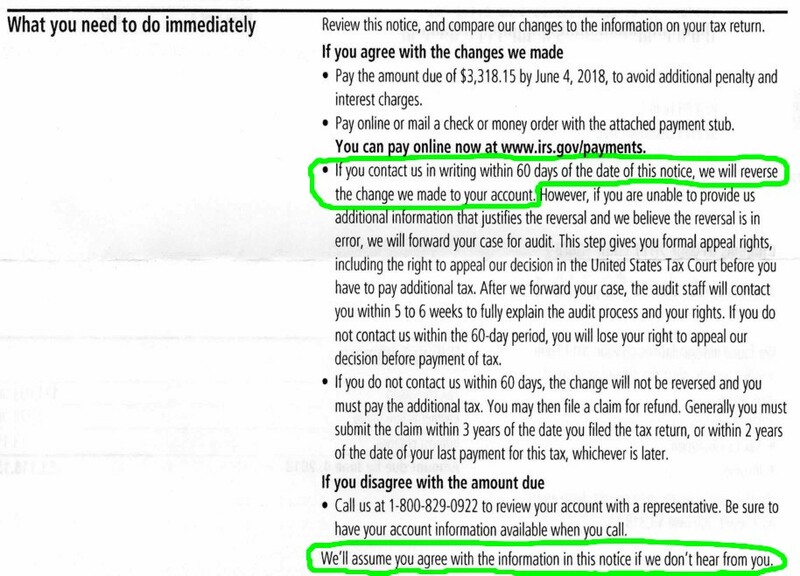 ), and faithfully reports all Joe's declarations and calculations-- that is, "the tax [$0.00] and /or credits [$13,511.00] [Joe] originally reported" to which the notice above refers. These remain the figures on which the newly announced "readjustment" and refund will be based. 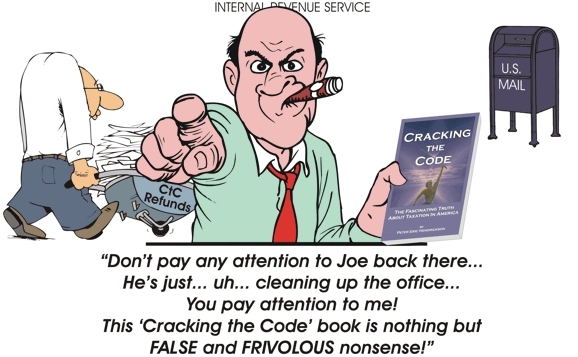 ALL IN ALL, JOE H.'S 2017 victory-in-progress-- in which the IRS just invites Joe to be confused and taken in by a pile of convoluted nonsense-- is a great testament to the truth about the tax revealed in CtC. The tax agency would never in a million years resort to this kind of smoke-and-mirror eyewash unless this was the best it had. And this can only be the best it has because Joe, informed by CtC, is unassailably right in his filing and his claims. Even though it is doing just as it promised here, I'll still leave that final warning about the robot in place. This time, however, it is offered with even more of a smile and a wink than the first time. SPEAKING OF THE FLAILING ROBOT, there is yet another happy thing I wish to share. Again, this is something brought to my attention the very day I was preparing for travel to San Antonio on the 21st (thus serendipitously allowing me to share and discuss it with the seminar attendees). This past June CtC warrior George Luniv-- who last year won the abatement by the IRS Office of Appeals of an asserted "frivolous return penalty" concerning his educated 2015 return-- won in Tax Court over the IRS assertion of four "frivolous return penalties" (FRPs) asserted in regard to George's filing for 2002. 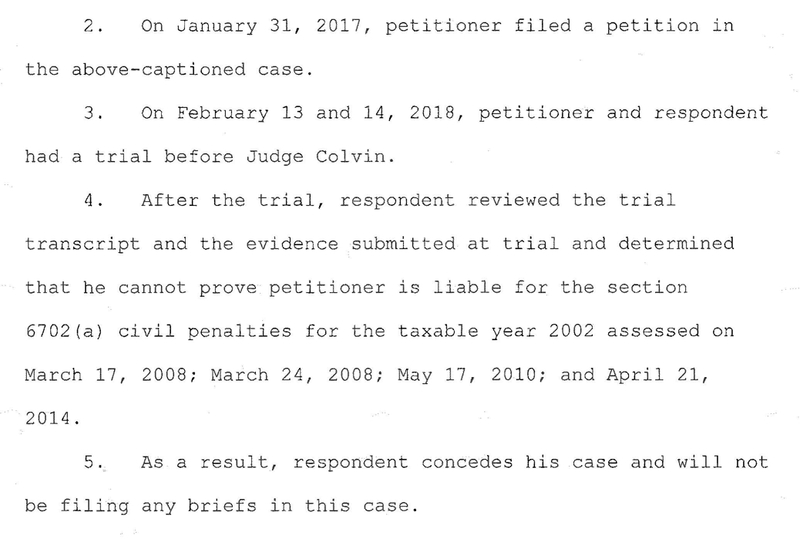 In fact, the IRS Office of Chief Counsel actually conceded the battle on these asserted penalties as soon as it became clear that he would have to prove the charges, and the Tax Court subsequently ratified the concession. 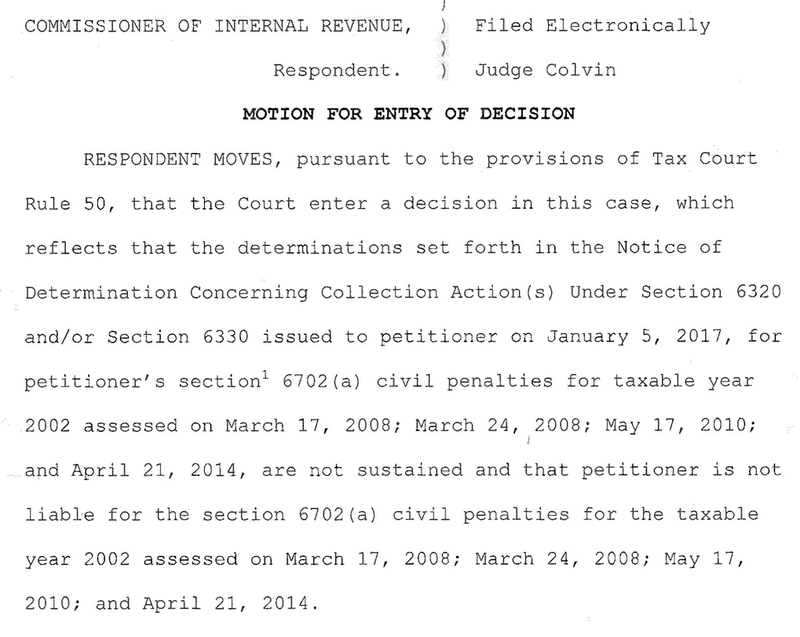 It is important to point out that unlike George's previous victory with the Office of Appeals, which did concern an FRP assertion in regard to an educated return and thus constitutes an official acknowledgement that CtC-educated returns don't qualify for the penalty, the FRP assertions involved in this newer Tax Court case concerned events pre-dating George's discovery of CtC. That said, the generic significance of this victory should not be missed. 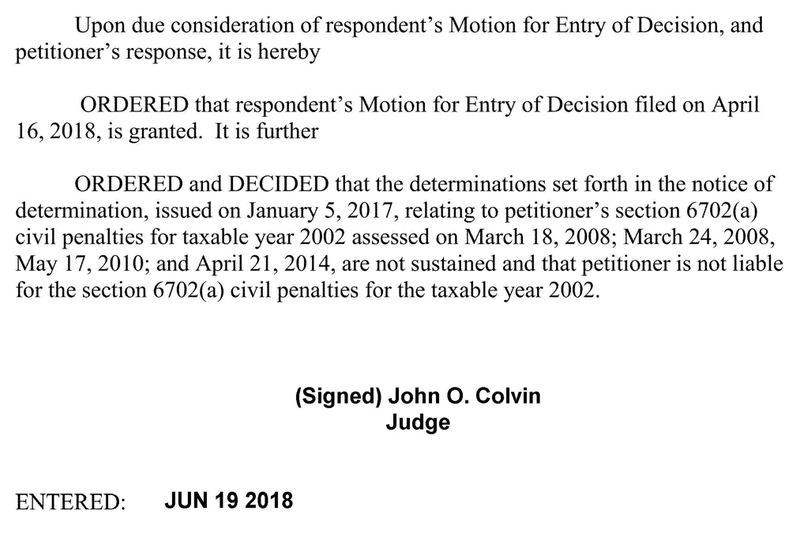 At a minimum, George's latest victory demonstrates concretely that the IRS engages in utterly groundless (and therefore fraudulent) "frivolous return penalty" assertions. By logical extension, any other adverse assertions by the IRS are also capable of being groundless ploys, ventured for the sake of intimidation, confusion or other unscrupulous ends. 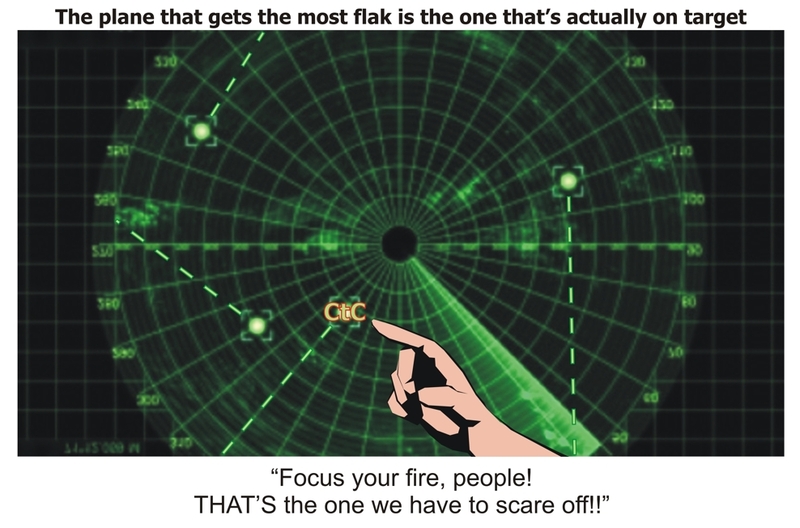 When held up alongside 250,000+ acknowledgements of the correctness of CtC, this evidence of IRS venality emphasizes and underscores more strikingly than ever that any pretense of resistance, dispute or disparagement of CtC is nothing more than that-- a pretense-- regardless from whose mouth or pen or keyboard it issues. Now, where are those confident videos by which this unassailable, swamp-draining, Leviathan-restraining, individual-empowering truth will begin to spread like a cleansing wild-fire? AND BTW, well done, George!! Once again!! Watch out for that robot! It's exploding!! 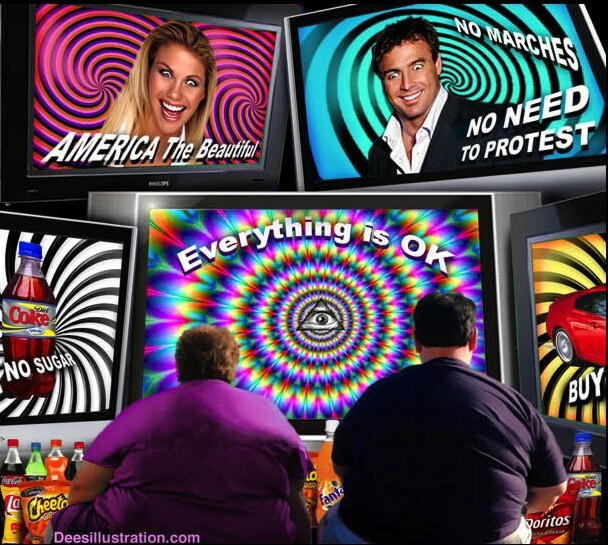 NOTE: YOU can be among those on the cutting edge of new developments in the battle of truth against pretenses and illusions. Be in Bakersfield, California this coming November 10! ...because clarity and accuracy are very much in the interest of those with the law and the facts on their side. 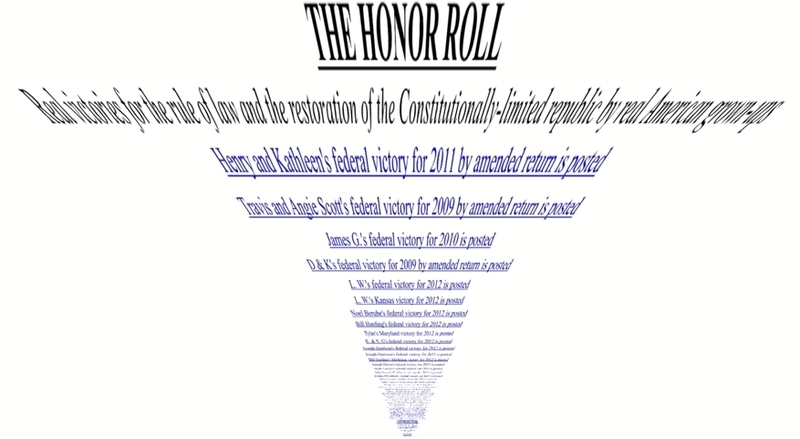 OVER THE LAST WEEK I HAVE RECEIVED DOCUMENTS from two different virtuous warriors-for-the-truth which each unfortunately exhibited a misunderstanding about the important tax-law term, "information return". In each case this term was improperly applied to a 1040. 1040s (and/or 1040Xs) are not "information returns". They are simply "returns" (either original or amended). The expression "information return" properly refers only to returns created by payors, such as W-2s, 1099s and K-1s. These are returns by which information is conveyed to tax agencies (and to payees)-- without regard to the accuracy or inaccuracy of the information, by the way; the label is drawn from the intended use of the form. Much confusion-- both in your own mind and that of anyone else-- will result from the improper use of the "information return" label. Thus, care should be taken in this regard. October 3- In 1849, Edgar Allen Poe is found in a gutter in Baltimore, an apparent victim of "cooping" (being drugged into incoherence and then taken from polling place to polling place and made to repeatedly vote as instructed). He dies four days later. In 1863, the fourth Thursday of November is officially specified as Thanksgiving Day by Abraham Lincoln. In 1908, 'Pravda' is founded. In 1932, Iraq gains its independence from Britain. In 1981, the hunger strike by PIRA and INLA prisoners at the Maze prison in Northern Ireland ends after seven months and ten deaths. In 1990, Eastern and Western Germany are reunited. 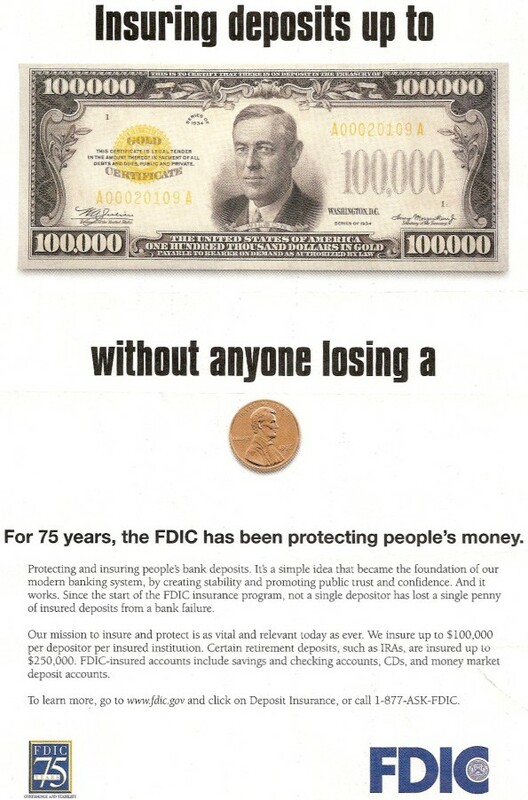 In 2008, George W. Bush signs the first $700 billion "bailout" bill, starting an ongoing process of looting the American people under the amazingly bold pretext that these further offenses will somehow ameliorate the effects of previous governmental abuse of the American financial and monetary structures. Tim Whitney Steps Up To The "Bad Guys" Challenge! October 4- In 1537, the first complete English-language Bible is printed. Two of the three translators suffer burning at the stake. In 1777, George Washington's assault on the British garrison at Germantown, Pennsylvania is defeated by Sir William Howe. In 1957, Sputnik 1 is launched. In 1988, "televangelist" Jim Bakker is indicted for fraud. In 2004, SpaceShipOne wins the Ansari X prize for the first private craft to successfully reach space and return twice within two weeks time. October 5- In 1143, Portugal is recognized as an independent kingdom by the Spanish throne. In 1910, the Portuguese citizenry overthrow the monarchy and declare a republic. In 1970, PBS begins broadcasting. In 1986, Mordechai Vanunu's revelations about the secret Israeli nuclear weapons program are published in Britain's Sunday Times. In 2001, the first victim of the post-9/11 anthrax attacks dies. October 6- In 1889, Thomas Edison hosts the first motion picture screening. In 1927, The Jazz Singer-- the first widely-screened "talking" picture-- opens. In 2007, the first human-powered circumnavigation of the world (using a pedal boat, kayak, roller-blades, bicycle and simply walking) is completed 13 years after commencement. I hope you read all of Roberts' article. It's very good, as they so often are. But I have to admit to having a love/hate view of Roberts. He is great at articulating a problem. But he can't bring himself to acknowledge the solution-- or to propose any solution, for that matter. Like many who have trained themselves to do research and to write, Roberts has conditioned himself into the delusion that if enough people are told of a problem, it will magically be fixed. Paul, it won't. People have to act to remove the resources by which power is exercised in order to thwart the evil-- or merely venal-- ambitions of those exercising the power. People have to reclaim those resources for themselves in order to become capable of undoing what the ill-exercise of power has already put harmfully in place. In short, We the People have to do as the Founders meant for us to do, and stop fueling Washington's bad behavior. We must make ourselves once again strong-- at its expense-- just as it has made itself strong at our expense over the last 80 years! October 7- In 1777, the British are handed a massive defeat and loss of an entire army by American militia in the Battle of Bemis Heights near Saratoga, New York. In 1868, Cornell University's opening day hosts an enrolled student body of 412-- the largest in any American university up to that time. In 1959, the Soviet probe 'Luna III' transmits the first-ever photographs of the dark side of the Moon. In 2001, the United States invades Afghanistan on the pretext that Osama bin Laden, a one-time CIA asset never yet charged with involvement in the events of 9/11 (due to lack of evidence, according to the FBI), is living there.